During the summer months, hundreds of UMBC students immersed themselves in high-value internships at companies, nonprofits, and government agencies. There, they learned about new fields, developed skills, and expanded their connections, taking advantage of UMBC’s strong network of emerging and established professionals who value both leadership and mentorship. 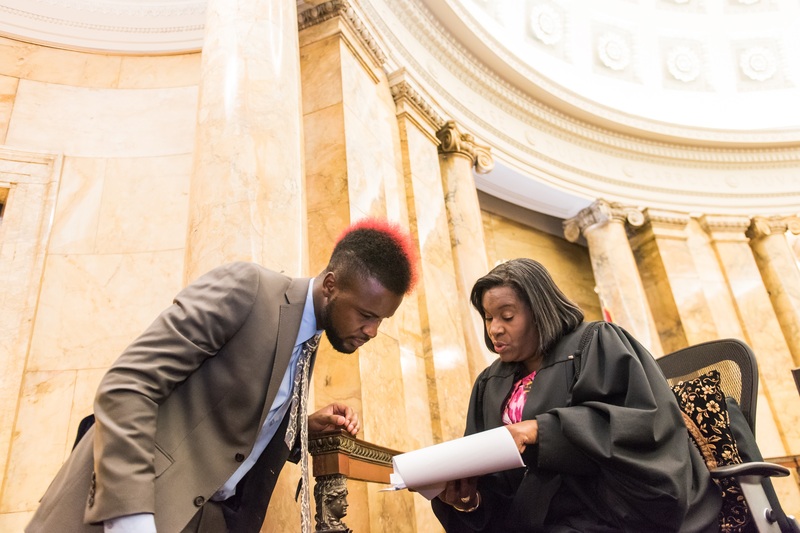 Over the past 18 years, Wanda Keyes Heard ‘79, political science, an associate judge in the Baltimore City Circuit Court, has mentored 25 UMBC students as interns in her courtroom. Randall Ainsworth ‘20, philosophy, spent this summer working with Heard. Receiving permission to join her on the bench during court proceedings offered him a bird’s-eye view of the round courtroom in the Clarence M. Mitchell, Jr. Courthouse. Randall Ainsworth, left, and Hon. Wanda Keyes Heard. Through her experience supervising interns over the years, Heard says that UMBC students have consistently exceeded her expectations and have delivered high-quality work. “This is real life. I am not giving [interns] busy work, I am giving them meaningful work,” she says. One of Ainsworth’s primary assignments has been to make recommendations for non-hearing motions based on what defendants request, and Heard notes that she has proceeded with many of his suggested actions. Ainsworth has particularly valued the chance to see the unique way Heard handles monthly “collateral days,” which have changed his perception of how the judicial system operates. Rather than only bringing people on probation into her courtroom after they have violated their probation, Heard began using collateral days to bring probationers in to check on their progress hitting the milestones required by their probation. Heard realized that some of the people who came into her courtroom were unable to read or lacked the education or skills needed to meet the job requirements of their probation. In response, she compiled a list of resources that people on probation can use to find jobs or advance their skills. “It’s a very satisfying feeling to see someone turn their life around, and contribute to society,” she says. For his part, Ainsworth has tremendously valued the chance to see how such a firm commitment to supporting people’s growth, even in difficult circumstances, plays out in the courtroom. 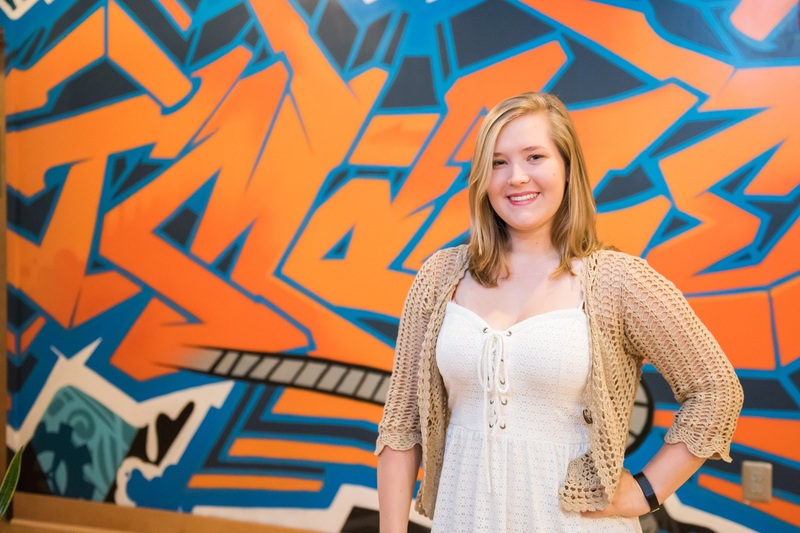 Justyna Kurbiel ‘18, visual arts, spent the summer interning at Image Factory D.C. (IFDC), a full-service design and production agency in Silver Spring, Maryland. Kurbiel learned of IFDC through her work at UMBC’s Commonvision studio, and then connected with IFDC senior designer and animator Andy Hsu ‘06, visual arts, M.F.A. ‘10, imaging and visual arts, through a UMBC visual arts project class. Kurbiel took advantage of the Career Center’s portfolio review services before reaching out to Hsu to submit her application materials. Her initiative and polished portfolio combined helped her land the IFDC’s first-ever student internship. She says that working alongside Hsu and two other UMBC alumni has helped her access valuable critiques of her work and has helped her learn about the design industry, workflow, and how to engage with clients. 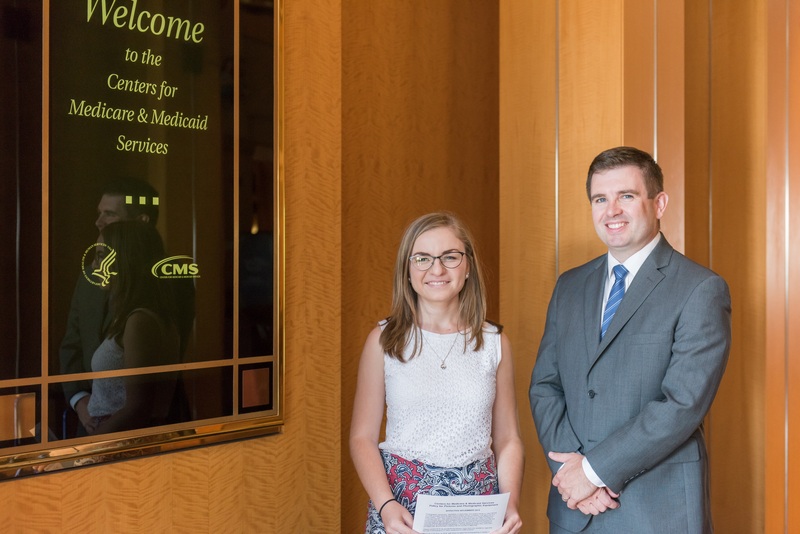 At the Centers for Medicare and Medicaid Services (CMS), Norina McAuliffe ‘18, mathematics, worked with Christopher Truffer ‘00, mathematics, a deputy group director on a team that reviewed Medicare and Medicaid spending and budgets from individual states. Truffer works to project Medicaid spending, budget and enrollment, and predicts the impact that proposed legislation could have on the program. He also reviews rates that states and private insurance companies negotiate and establish to ensure that they are actuarially sound, and comply with CMS and federal policies. Norina McAuliffe, left, and Christopher Truffer. 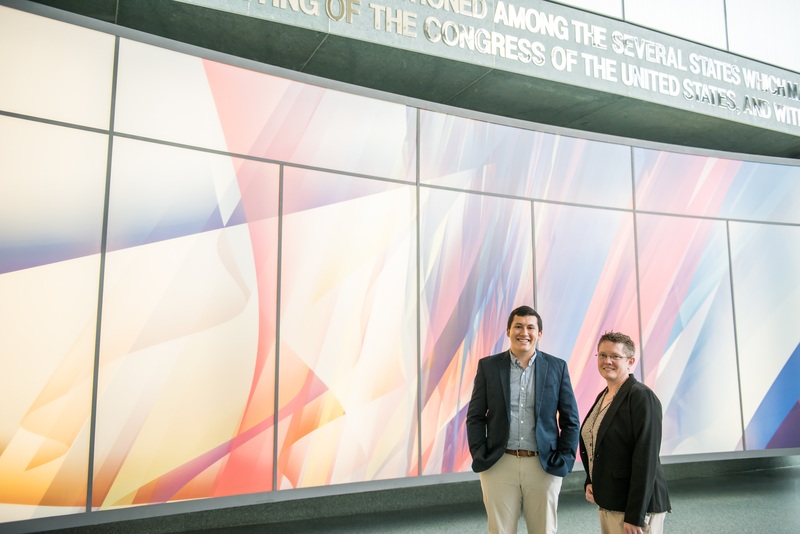 Like McAuliffe, Evan Avila ‘19, economics, also spent the summer interning at a federal agency, supervised by Angela Delano ‘95, mathematics, at the U.S. Census Bureau. 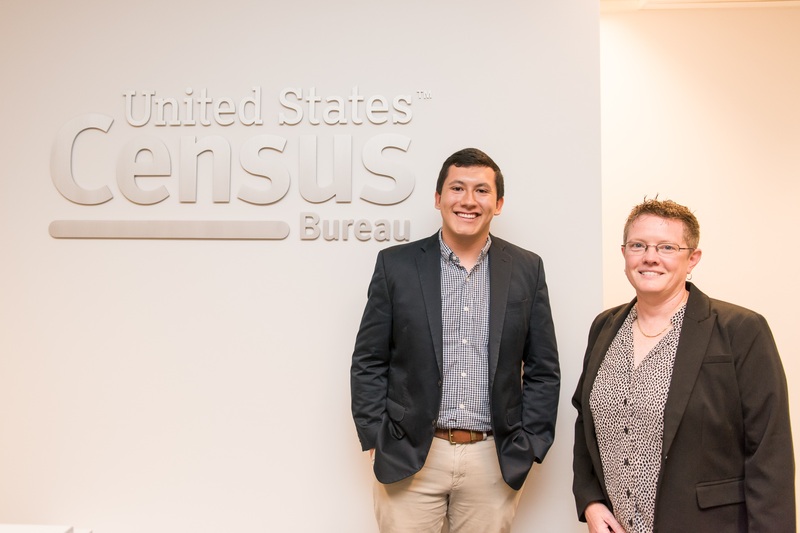 He learned of the opportunity through the Hispanic Association of Colleges and Universities (HACU), a nonprofit organization that works with government agencies to increase diversity in the federal workforce, and, after applying, was selected for an internship by the head of the U.S. Census branch. Evan Avila, left, and Angela Delano. Through HACU, Avila, a Sondheim Scholar, lived in Washington D.C. during his internship. He says that the experience of living in D.C. and working at the bureau—where he’s had the chance to connect with interns from across the country—emphasized for him the quality of his UMBC education. “I’ve met people who go to Ivy League schools, and I can say, unequivocally, that the education I have received at UMBC has been world-class, and been on par with the other people I have worked with at the Census Bureau,” he says. 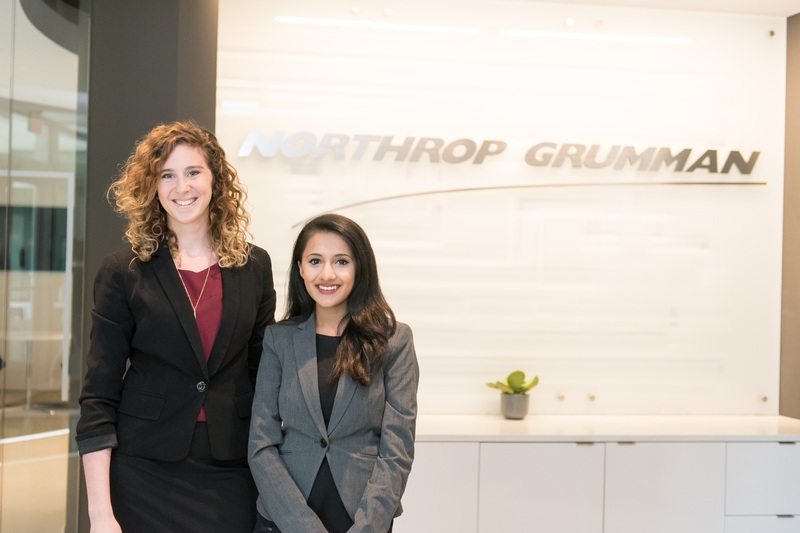 Cyber Scholar Priyanka Ranade ‘18, information systems, spent the summer at Northrop Grumman as a cyber strategy intern, under the mentorship of Lauren Mazzoli ‘15, computer science, M.S. ‘17, computer science. Mazzoli herself was mentored by Chris Valentino ‘02, information systems management, M.S. ‘06, information systems management, as an intern during her undergraduate days, and is now on his team at Northrop Grumman. Lauren Mazzoli, left, and Priyanka Ranade. Ranade heard about the internship opportunity through a Cyber Practicum course offered at UMBC, and embraced the chance to learn more about the varied facets of the cybersecurity field. “When people think about cybersecurity, they usually think about tools and cyber warfare, but a lot of times people fail to think about the business,” she says. As an intern, Ranade had a chance to build, review, and update business briefings, examine corporate policy and goals, and review white papers. Zach Dzielinski ‘19, information systems, interned with Dan Hood ‘01, computer science, at ClearEdge IT after learning about the company at a UMBC career fair. 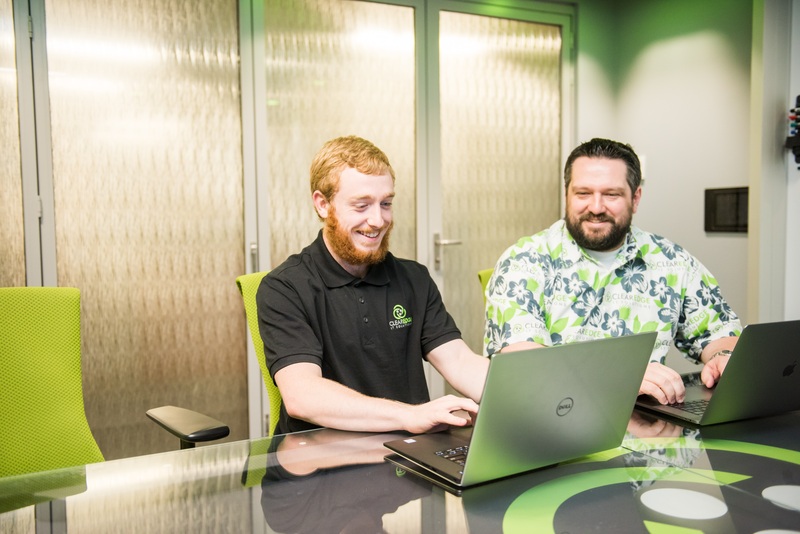 He focused on setting up software used by in-house developers to perform various analytical tasks, and he particularly valued the chance to gain experience with industry-specific tools. 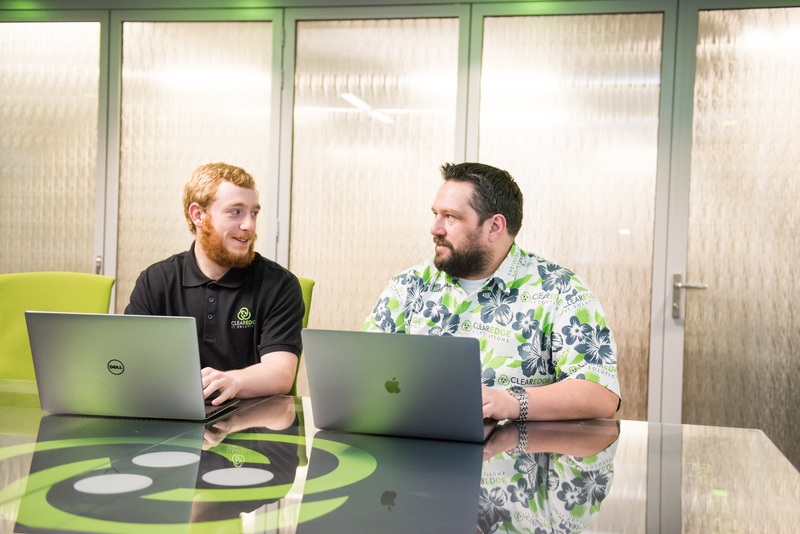 “The amount of resources available at ClearEdge IT gives me the opportunity to work with a lot of things that I might not be able to [work with] somewhere else,” he said. Zach Dzielinski, left, and Dan Hood. Hood has supervised several interns from UMBC during his time with the company. He focuses on getting a sense of “the particular skills they are coming in with, and where the gaps might be,” to make sure he provides an internship experience that will “leverage the strengths and close the weaknesses as much as possible.” Dzielinski is keen to continue using the new skills he has developed as he grows his expertise. 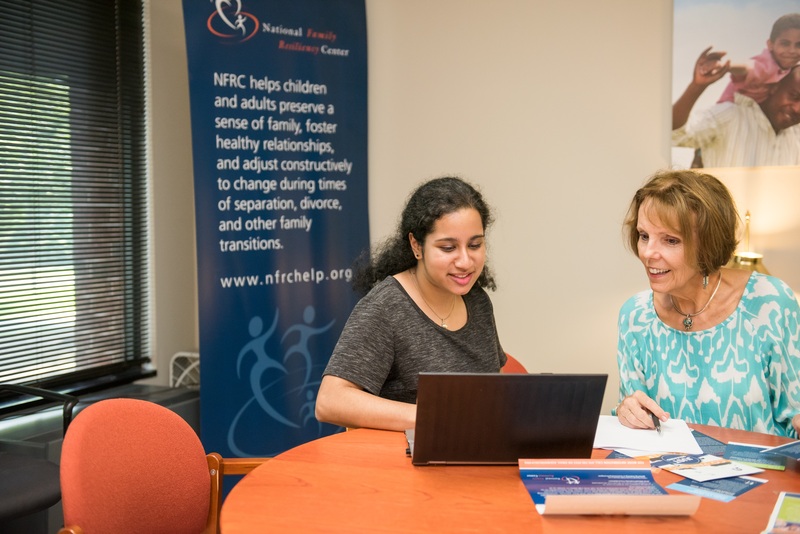 Geeta Shanbhag ‘18, media and communications, initially connected with the National Family Resiliency Center in Columbia, Maryland, as a volunteer, supporting their mission to provide programs and counseling services to children and adults who are working through divorce and other changes within their families. As an intern, she gained an opportunity to boost the organization’s visibility through marketing, outreach, and social media. “A lot of times people know about NFRC through smaller networks, but those networks don’t quite intersect in a way that would be beneficial to getting the word out about the Center,” Shanbhag explains. Geeta Shanbhag, left, and Kathy Helt. Kathy Helt ‘87, health science and policy, associate director at the NFRC, supervised Shanbhag and says that she aims to give interns comprehensive overview of the Center and have them “experience as much hands-on work as possible.” By getting a broader sense of the supports the NFRC offers, Shanbhag was able create more effective communications to reflect the experiences of families at the Center in a relatable way. 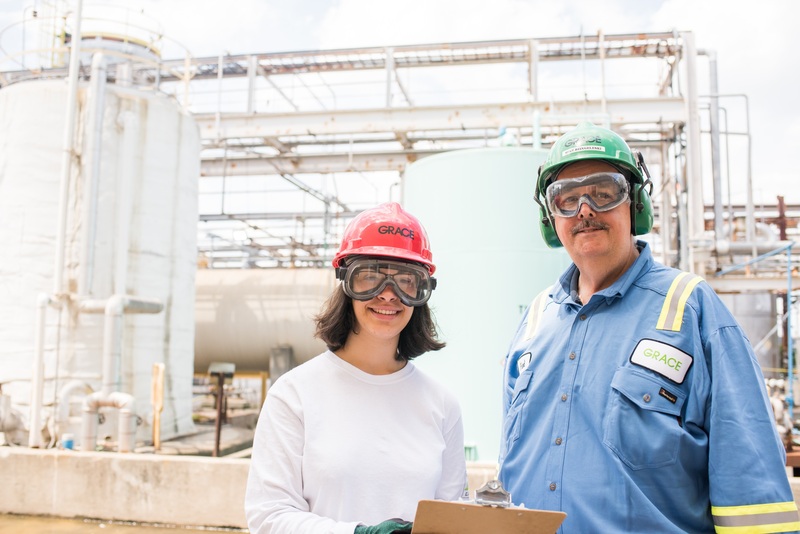 CWIT Scholar Theodora Martin ‘18, chemical engineering, interned in the hydroprocessing unit of the W.R. Grace chemical plant in Baltimore, where she frequently collaborated with processing engineer Mike Dzingeleski ‘91, chemical engineering. The company makes silica gels and catalysts that are incorporated into toothpastes, plastic gallon containers, paints, medicine, and spices. In toothpastes, the silicas are the abrasive agents that clean teeth, and in spices and herbs, silicas prevent caking. Theodora Martin, left, and Mike Dzingeleski. 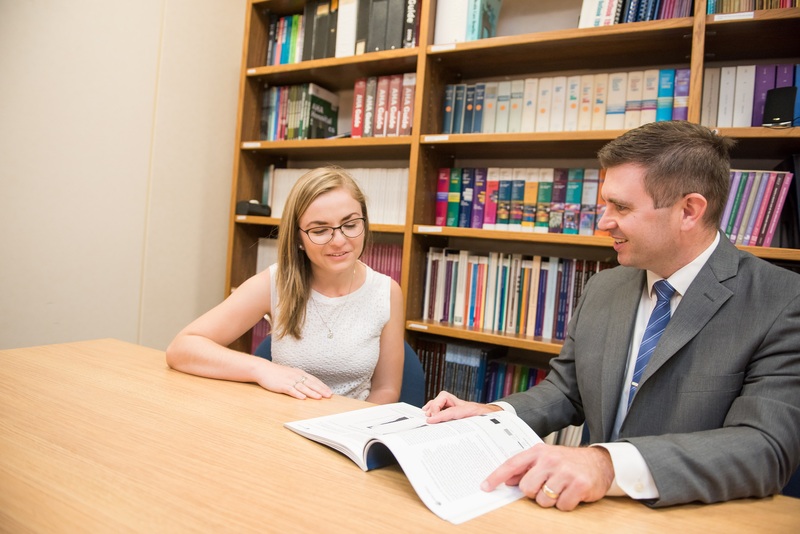 One of rewards an internship can offer a student, Dzingeleski reflects, is a chance to get a sense of what type of job is a good match for their interests and strengths. “It’s just as important to find out what’s not a good fit as what is a good fit,” he says. 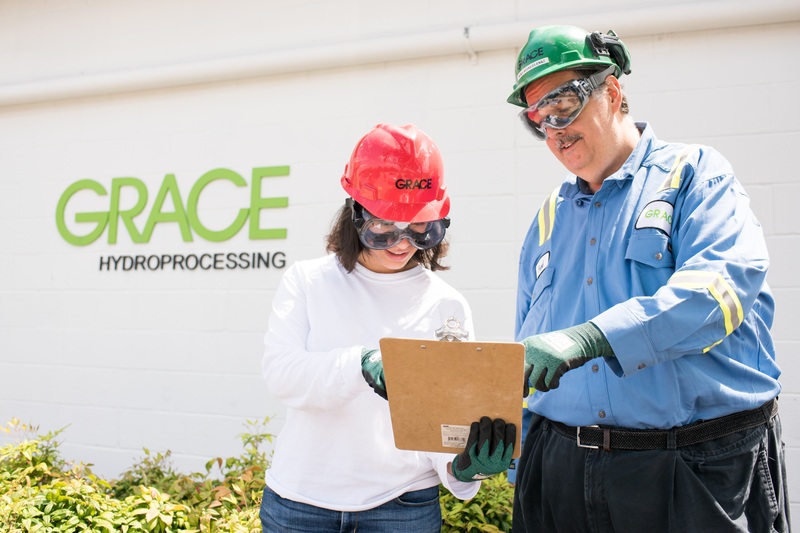 For her part, Martin tremendously enjoyed the chance to see what she learned in class be put into action at the W.R. Grace plant. The experience is helping her reimagine her possible career paths in new ways, and with fresh enthusiasm. 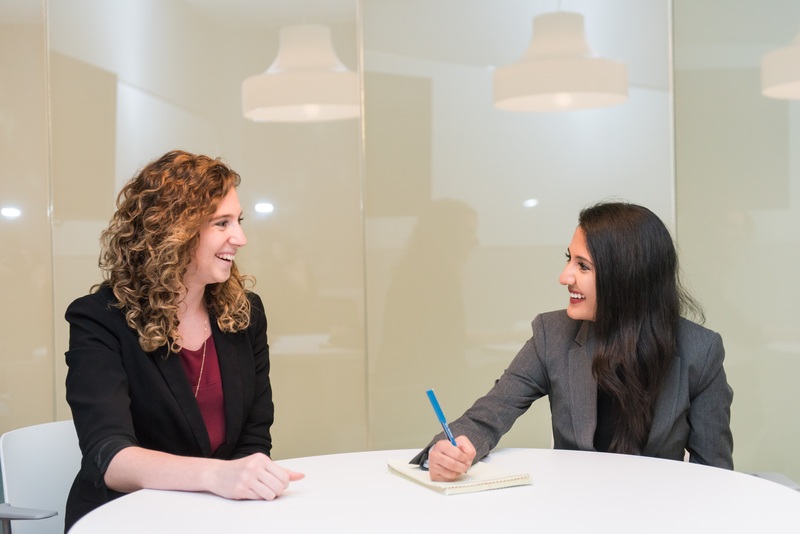 For more information on how to prepare and apply for internships, and to connect with employers, visit the UMBC Career Center. Find photos of more student summer internship experiences—from Apple, Microsoft, and Cisco to law offices, chemistry labs, and construction sites—on Twitter with #UMBCintern. Kathy Helt, left, and Geeta Shanbhag. Justyna Kurbiel, right, with her colleagues at IFDC. Banner image: Randall Ainsworth, and Hon. Wanda Keyes Heard. All photos by Marlayna Demond ’11 for UMBC.